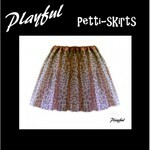 Playful Pettiskirts are designed as an outerwear garment but is often a popular choice as an under dress mini petticoat for dancers, hen parties and teenagers. If you are requiring a serious petticoat to wear under your full circle or vintage dress you will need one of our other styles of petticoats, which are specifically and professionally designed for that purpose. Click the button below to add the Playful 45cm long Pettiskirt Tutu to your wish list.